Oh my heart! There is just something about books about dogs that gives them the ability to touch on every single one of my emotions. I am going to let you in on a little secret. I love dogs. A lot. I like my three dogs more than I like most people and would love a chance to spend one moment in their heads so this story really appealed to me on every level. I loved this book when I read it years ago and I loved it just as much when I listened to the audio for a re-read. It was a lot of fun to spend a few hours in Enzo's mind. I was really kind of surprised by how much of the book I actually remembered from my initial read years ago but it seems that this story had really stayed with me over the years. I loved Enzo's voice. Did he sound like a dog all of the time? Probably not. I mean I think if I were to hear one of my dog's internal monologues there would be a lot of requests for snacks and ball playing and not a lot else. Who knows maybe I am wrong and my dogs are pondering the meaning of life but I honestly doubt it. Enzo is a bit of a philosopher and hopes to eventually get his chance as a human. Nothing really gets past Enzo and he seems to figure what is going on in his house before the humans do. This isn't just a book about a dog. It is really a book about a family that is told by the dog. Denny is Enzo's human and he has some really high points in the book and some really low one. With everything that Denny has to deal with in this book, it is amazing that he is able to stay so positive through it all. The one constant in the story is the bond between these two. We get to see Denny adopt Enzo as a puppy and then go through a lot of milestones together. This was the first time that I have listened to Christopher Evan Welch narrate a book and I thought he did a great job with this one. This was a rather emotional story at times and I thought that he really was able to pack a lot of feeling into his reading. He used a very pleasant reading voice and read the story with perfect pacing. I would definitely listen to his work again in the future. I would recommend this book to others. I probably felt just about every emotion while listening to this one. The only part of the book that I wasn't a huge fan of was the epilogue because it was just a little too much for me and didn't feel necessary. I do love the book and will probably read it again in a few years. 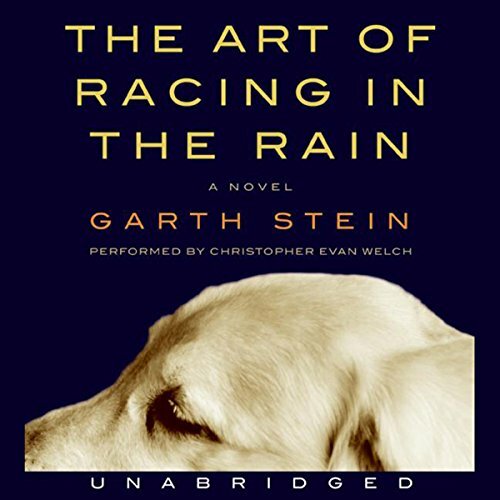 Garth Stein is the author of the New York Times bestselling novel The Art of Racing in the Rain (and its tween adaptation, Racing in the Rain), as well as Enzo Races in the Rain!, his first picture book. His other novels include How Evan Broke His Head and Other Secrets, Raven Stole the Moon, and a play, Brother Jones. Garth lives in Seattle with his family and his dog, Comet. Dog books can be so hard to resist! Oh I loved this one when I read it. I think I need to do a reread via audio now!! I really liked the narrator for this one, Grace! I've only read two books from a dog's perspective and I enjoyed them. I'd definitely read Enzo's story. I've always wondered what our dogs and cats are thinking at times when they watch us. Enzo is quite the thinker, Sophia Rose! Oh wow, that is definitely different and it sounds really good. What made you mad? I am very curious. This book is one of my faves. I need to do a re-read as well. I'm still waiting on the movie!!!! Is there a movie in the works for this book? This one is really worth the read, Lily! I've had this one for years and am afraid to read it. I fear it will make me cry for days! I didn't think that this one was as much of a tear jerker as other dog books that I have read.